Everyone will think you have magic powers when you 'blow out' these battery powered LED candles. You can blow them out like burning wax candles or turn them on/off by shaking them upwards and downwards. You can also turn them on/off the traditional way, with the button on the bottom. You can forget worrying about blowing your candles out at the end of the night, our candles pose no fire risk. These battery operated candles are made of real wax, flicker like real candles and require 2 AAA batteries. Set of 2 EcoGecko Magic Candles, blow them out like real burning wax candles or simply shake them upwards and downwards to turn the flame on or off. You can also turn them them on/off by pushing the button on the bottom. 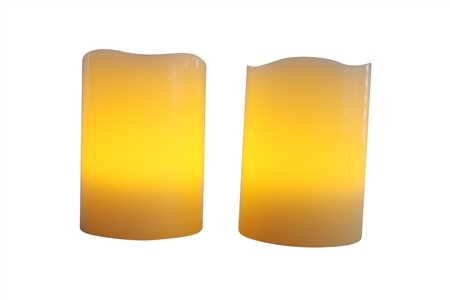 Made of real wax and flicker like real candles and glow with a beautiful soft amber color. They are battery powered and take 2 AAA batteries. The candles are both 4" in height, 3" in diameter, the perfect size pair. Safe to use, no risk of fire, no fume and no wax mess. Safe around home, seniors, children and pets. Premium quality flameless LED candles, ideal for everyday use at home, restaurants, hotels, bars, weddings, birthdays, anniversaries, or any occasion or time you want a little ambiance.